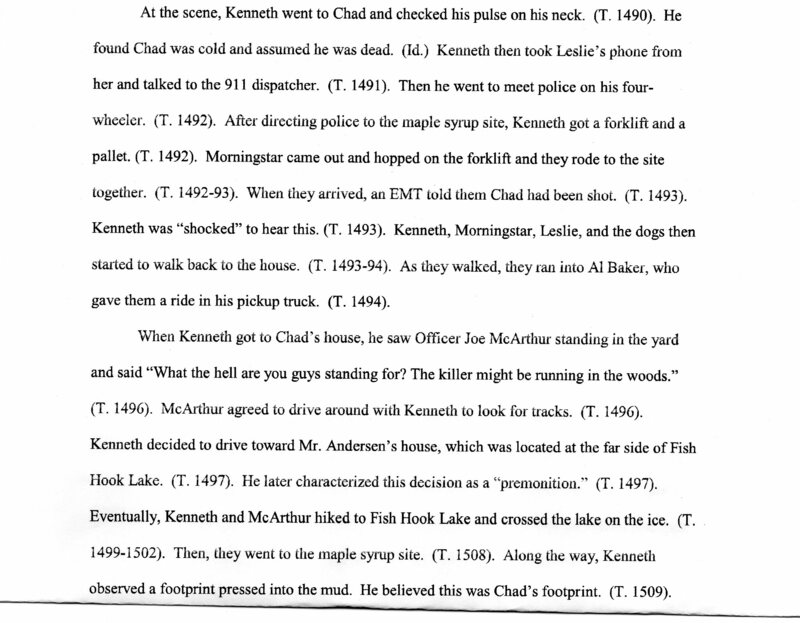 This blog tells the story of how Kenneth Andersen was wrongfully convicted of the tragic murder of Chad Swedberg in White Earth, Minnesota. It contains police reports, police recordings, witness statements, and legal briefs that give in great detail how this came to be. Currently, Mr. Andersen has an appeal before the State Supreme Court and is waiting a decision. One of the most difficult chores in telling this true story has been getting people to talk. Jurors and members on the community shun any publicity in fear of retaliation from authorities. Thank God for the brave souls who have come forward and shone a light on the truth of this awful crime. Ken and his family have asked me to offer a reward for information. Contact me – John Bucher – at this blog. Under “comments” leave me a message of what you know and how to reach you. Your information will be kept confidential and not published. Kenneth Andersen’s latest petition asking the court to at least READ his list of defects of his wrongful conviction and new evidence that was not known when Becker County railroaded him into a life sentence for a crime he did not commit, will appear before the court on December 5, 2017. Below is the response and exhibits of Ken Andersen’s response via his attorney to the state of Minnesota’s claims against giving him a new and fair trial. They begin by calling the first section “Andersen’s Murder of Chad Swedberg”. That leaves little room for doubt that they want a judge to believe them and not consider they may have it wrong. As they tell their version of this, notice the “state”, or whoever wrote this, still admits that no one actually saw the murder, or did anyone confess to it. Since they had nothing new, they simply re-tell the same story the original prosecutor did. This is after some notable attempts at intimidation, once again of some of these witnesses. 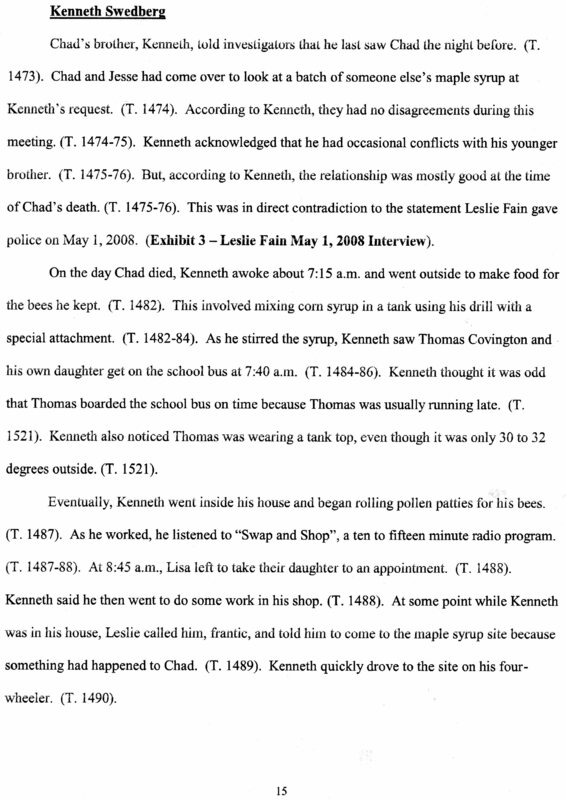 They still claim the ATV was enough of a motive for Ken to kill his best friend. They repeat once again Ken’s activities the day of murder without ever placing him at the scene. They NEVER mention Leslie Fain’s doubling of her husband’s life insurance the day of the murder. They still don’t know the caliber of the gun that was used. They suppose everything John MacArthur said is true and everything Ken said to be a lie.Folks, you can not arrive at the truth with this much prejudice. This type of justice will put an innocent man in prison, and let a murderer go free. They try to squash the fact of the 911 domestic call that morning. While they admit they wiretapped Ken’s calls to his lawyer, they claim it still doesn’t matter, no matter how illegal it is. Some of most incredible things in this document is how they claim Al Baker’s statement he saw shell casings and cigarette butts at the scene, by saying “just because he said it doesn’t mean it happened”. They go on the dismiss Stacy Weaver’s statement saying he saw Leslie Fain the morning of the murder ( making everything else she said untrue), by claiming this all comes to late and should not be considered because it is over the time limit. I plea with the citizens of White Earth to demand a new and fair trial and let a new jury, one with Native Americans, consider the whole truth, not just parts of it, and decide if these facts matter.